Do you ever get the feeling of being watched? That feeling that someone is always there? Even when you are all alone? 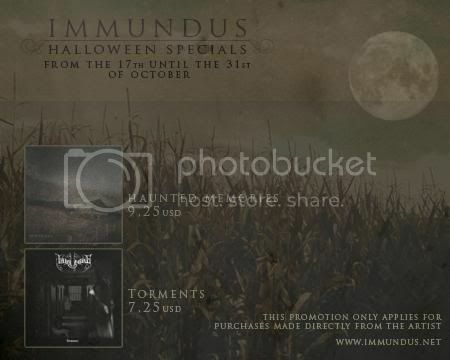 Dont miss out on this oportunity on having Immundus CDs for your halloween parties!!!! Description: "Again, another moody soundtrack for a rainy night - 'Alone with the rain' awaits all open minded listeners with a mix of various dark music genres." Immundus has been nothing but a pseudonym since my early teens on all the music project and bands I was involved with back from when I was 15 years old...nowadays it has become a part of me and therefore transformed into an ambient music project mainly based on haunting and ghostly atmospheres under this same name. Did you think you would be involved in music when you were young? New Interview with 'Meridian 9 Magazine' now online! The Interview made with Meridian 9 Magazine is now available for reading online, both on the official website and on Myspace blog so feel free to stop by and have a good reading. Decoy - Have a listen! Immundus presents you "Decoy", made in collaboration with Nausea, this song will feature on Immundus new release "The Method Learned II" a free EP to have its release this coming Fall. You can have a listen to the song on the Myspace profile and feel free to leave feedbacks at the same time. More Information and news regarding this EP will be announced soon so keep on the lookout.